As many of my readers know, I’m passionate about grass fed meats. Grass fed or pastured meats – meats from animals that have never been fed grain – are becoming very popular because they are so healthy. But the improved health is not the only thing that is different about grass fed meats. How you cook them is different, too. And in this case, what you don’t know will definitely affect your success in making the switch. Ignorance is not bliss, at least when it comes to preparing grass fed meats. Whether you buy from a local farm or local butcher shop, you need to know where your meat comes from. In this modern age, the only way to know your meat is safe is to follow this rule. Big box, outlet, and chain stores may advertise “pastured” or “grassfed”, but a label on a Styrofoam shrink-wrapped package of meat means nothing when compared to a relationship with a real person you know and trust. What’s more: local, known and safe also means fresh and delicious! Take that beautiful steak, roast or ground meat out of the refrigerator and set it on the counter at least one hour before cooking. 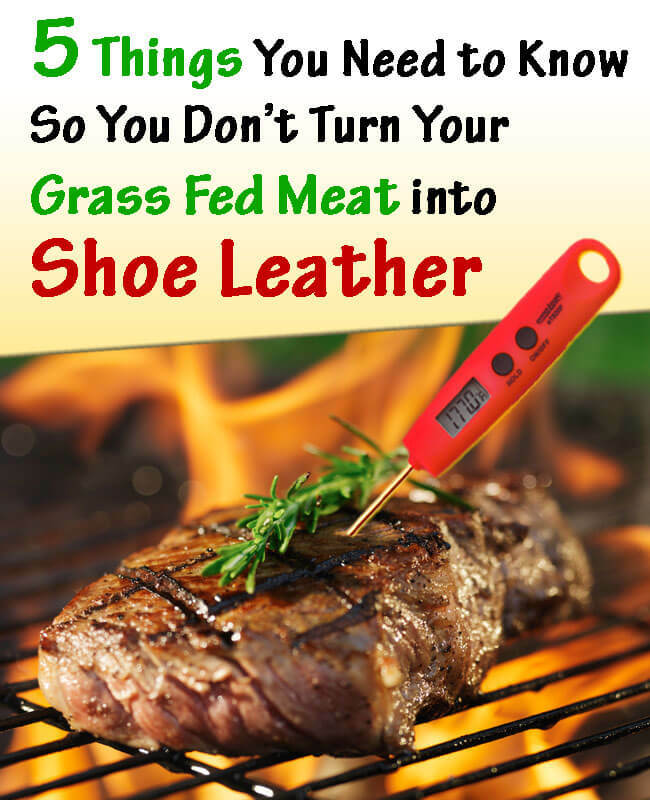 Grass fed meats should be at room temperature before you start cooking them. If it’s a really large or thick cut or roast, set it out two hours ahead of time. Make sure the meat is properly wrapped or covered while warming up to room temperature. For tender steaks and amazing roasts, bring the meat to room temperature a day in advance, and then rub in some high quality virgin olive oil and your favorite seasonings: rosemary, garlic, black pepper, thyme, oregano, or whatever other herbs are your personal favorites. No salt! Place the meat in a glass baking dish or loaf pan, pour additional olive oil over the meat until it reaches about half way up the sides of the cut of meat. Seal with plastic wrap and leave out for one hour. Then return it to the refrigerator until one hour before you plan to cook it. Lift and turn the meat over in the oil when you first bring it out of the fridge, and cover it up again. Before grilling, pan frying or roasting, use a knife to gently scrape off the herbs and excess oil. When you grill, pan fry or roast grass fed meat, get the temperature up to at least 350°F before you start. If you’re roasting or pan-frying the meat, start by searing it in a very hot pan with a bit of tallow, lard, or butter in the pan. Get the pan very hot, and then quickly move the meat across the pan, turning until it is browned on all sides. If you’re roasting, when transferring the meat to the oven, start at 350°F for 20 to 30 minutes. Then, drop the temperature to 225°F to 250°F for the remainder of the cooking time. (You can use a covered roasting pan, or a braising pan with liquids and a cover.) For grilling or pan frying, it’s the same idea – but you actually remove the meat from the heat source and let it rest between cooking sessions. So, for steaks, for example, you put them on the grill for 2 or 3 minutes each side. Then you put them on the warming rack or on a part of the grill that is not hot, and close the grill back up and let them rest for 2-4 minutes. Then return them to the heat and let them go for another few minutes before testing for done-ness. The times depend on the thickness of the cut, the temperature of your grill, and the distance to your heat source. If you’re pan frying you can remove the pan from the heat, and then return it to the heat. Don’t simply turn off the burner and leave it where it is, as the burner will, in many cases, remain hot even with the heat turned off. This is particularly true of electric stove tops. If you don’t already have a meat thermometer you are absolutely in love with, then keep reading. I have spent years fighting with defective, clunky, slow(!) unreliable, and inaccurate meat thermometers. No more. At some point I had just had enough. I actually threw out every single meat thermometer in my kitchen. The analog round-dial dude, the stick-the-probe-in-the-turkey-in-the-oven-with-the-wire-to-the-magnetized-display-on-oven-door-jobby, the swivel-head-“instant-read”-digital-hoohaa, the hideous clunky fold-in-half, crescent-shaped-flimsy-always-defaults-to-celsius-jobby – every single one of them. I am a cook, therefore every one I know assumes I need a thermometer for every gift occasion. The sad part of this is none of them know what a good thermometer is. It’s taken me a long time, but I finally found a digital meat thermometer I actually love. It’s fast, 5 seconds – no internal meat thermometer can do true “instant read”, and this is as close as you get. In 5 seconds you know if you’re ready to take your meat off the grill, out of the oven, or off the pan. Any good cook knows: if you are within a few degrees of your target temperature, you are done. Resting meat will continue to rise in temperature by several degrees, but waiting for 20 to 30 seconds to find out if you’re even in the neighborhood of your target temperature is not just frustrating, it’s downright irritating. My friends over at ennoLogic make an amazing thermometer they sell on Amazon. I love it. I told them, they have to make another special deal for my readers. And they agreed, so here it is. You get their wonderful meat thermometer at 70% OFF while supplies last. They have set aside a limited amount of inventory for this special offer at my personal request. Don’t waste any time. Go get yours now. Use code YUMDEAL7 at checkout. I don’t know how long this inventory will last, and the deal ends on Oct. 31st 2015. This blog post has become very popular, so don’t dilly-dally or you’ll miss this special offer. 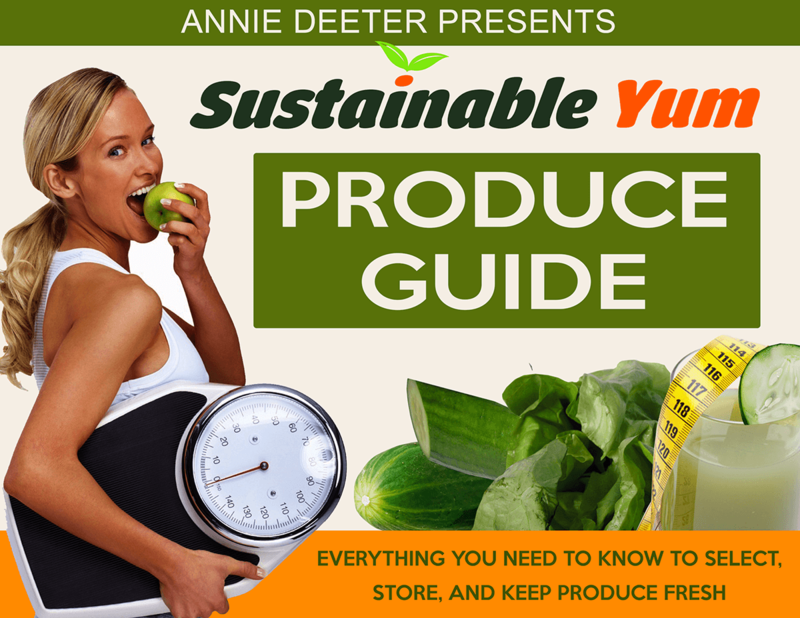 For more information on grass fed meats, check out the resources below and have a look at my book Healthy Clean Eating Recipes: Grassfed Beef.